On my way home from Paarl I decided to visit one other wine estate. As I couldn't decide which one I wanted to visit, I decided I would drive until one jumped out at me. Mt Vernon it was!! 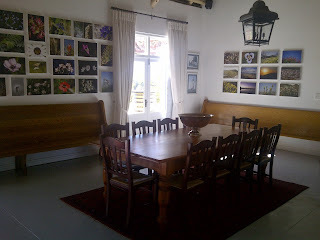 As I arrived a man came in to the tasting room from outside and took me through a wine tasting. As we went through the tasting I realised he was the winemaker, awesome! Nothing better than a tasting with the winemaker himself. This cute little dog was present for most of my visit. 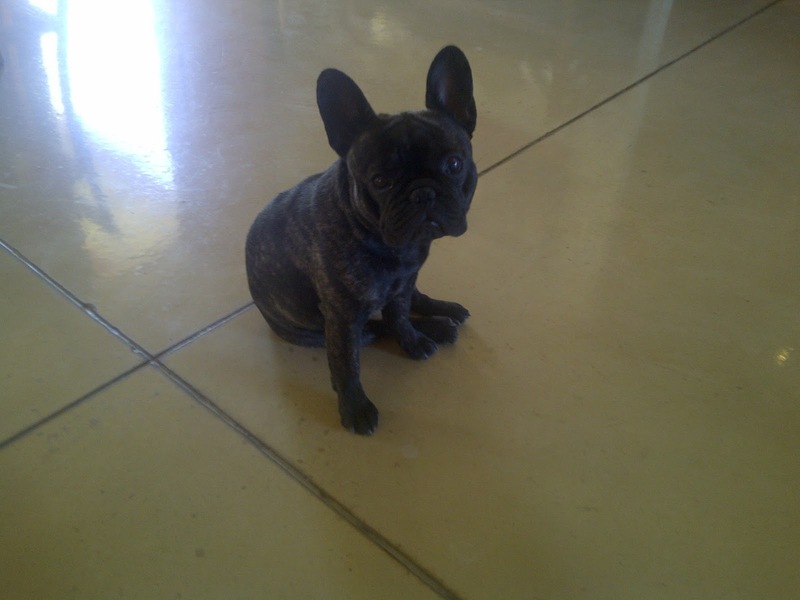 He is absolutely adorable!!! 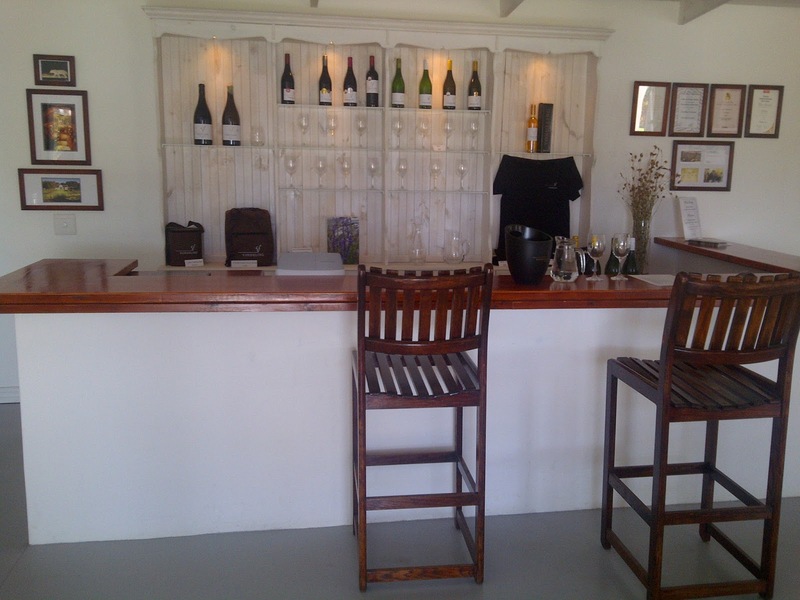 We started off with the Unbelievable Dry White 2012 at R23.50 a bottle. This is from their entry level range. It was easy drinking and light. 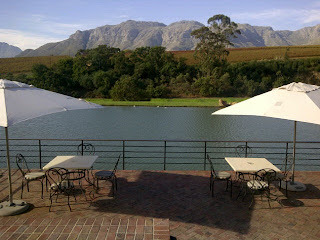 The Jean Pierre Rose 2011 at R36 a bottle. 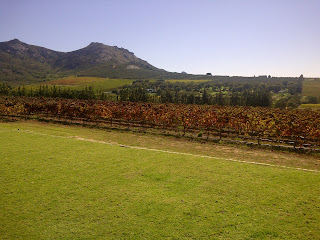 It is mostly made from Merlot with some Shiraz and Pinotage. It was easy drinking, light, off dry and had tones of strawberry. 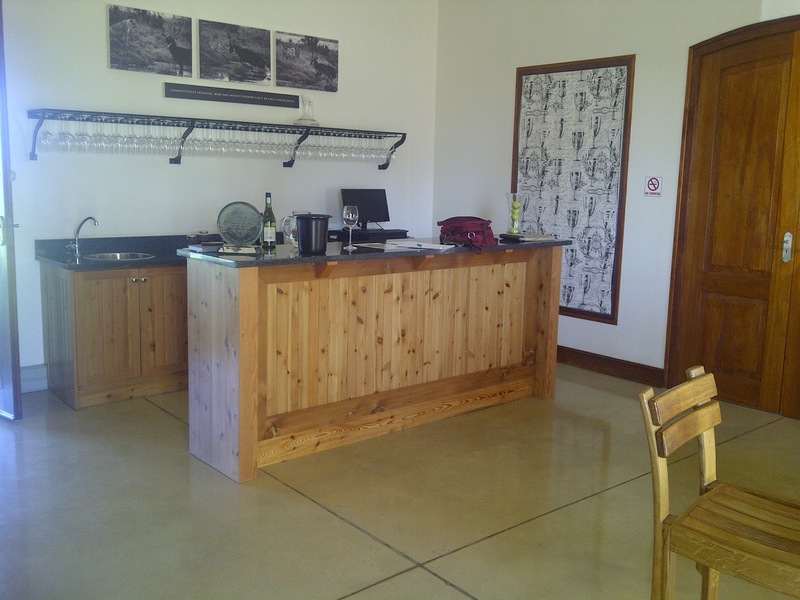 Three Peaks Sauvignon Blanc 2012 at R44 a bottle. It was lovely on the nose with tones of apple and pear. It was light, rounded, soft and not acidic. It was a pleasant wine. 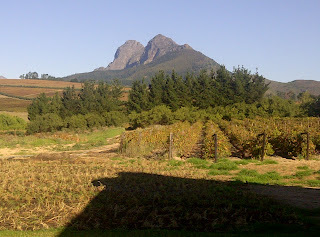 Mount Vernon Chardonnay 2010 at R100 a bottle. It spent 8 months in barrels. It was a beautiful yellow colour, with a soft fruity aroma, light, lovely texture, pleasant on the palate. Easy drinking. Oak influence was minimal; no butter or butterscotch tones. There were hints of lemon though. This Chardonnay comes from only 3 hectares of vines. Three Peaks Cantata 2010 at R53 a bottle is 15 % alcohol, which is quite high. It is a blend of Shiraz, Pinotage, Petit Verdot, Merlot, Cabernet Sauvignon and Malbec. It was soft, smooth, a heavier, more serious red. I think it's best to decanter or serve with food. 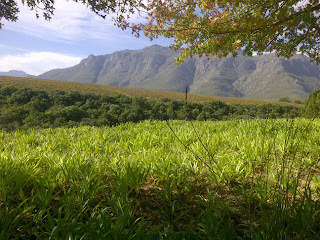 Three Peaks Pinotage 2011 at only R42 a bottle. I loved this wine!!! It was beautiful on the nose, smooth, elegant and beautifully balanced. I could not get over how low the price was for this wine. I highly recommend this wine, especially at this price!! 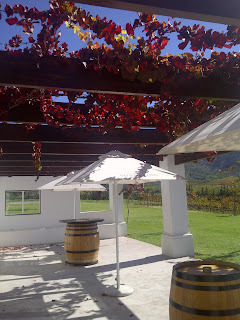 Mount Vernon Malbec 2010 at R165 a bottle with 15% alcohol. The legs are stunning, flavour was intense, yet soft, I loved it!! It was amazingly creamy, soft, fruity and a little spicy. I love this wine!! It goes well with the olives they sell on the estate. Be sure to try their olives!! I am not a fan of olives, but their olives are very nice!! I think this wine would go nicely with heavy/fatty/rich food also. Mount Vernon Cabernet Sauvignon 2009 at R150 a bottle has a eucalyptus smell and taste which is quite unique. It has an intense smell, unique taste, is smooth, rounded, and creamy. Last but not least I tried the Flamenco Sangria 2012 at R30 a bottle. The Sangria was very pleasant, I loved the fruit flavours which were so prominant. You could taste the citrus flavours. It was light, easy drinking, nice and refreshing. 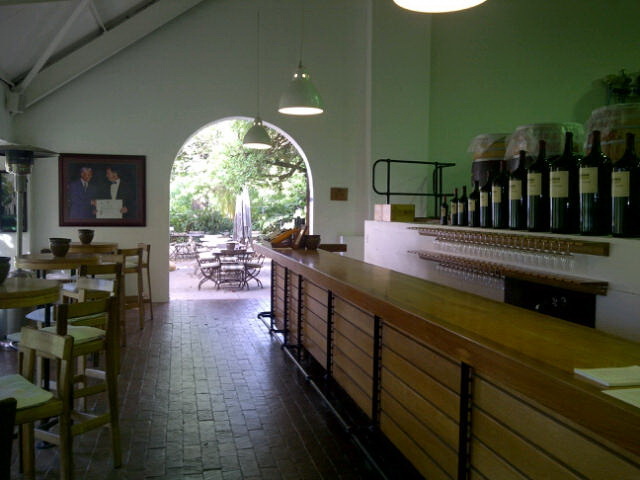 The winemaker is Philip Du Toit and he has been the winemaker there since 1997!!! He is a very pleasant, friendly, and hospitable guy. I enjoyed doing the wine tasting with him, especially as he was able to share stories which only a winemaker would know. It was cool. 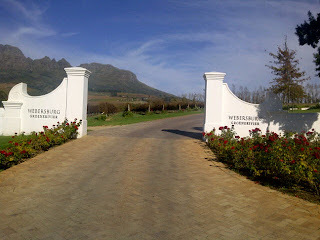 I recommend visiting this estate. 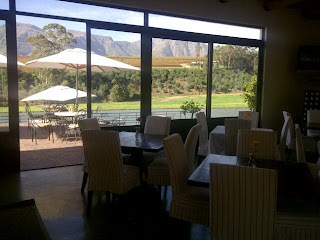 The olives, Pinotage, Malbec and service were the highlights for me!! 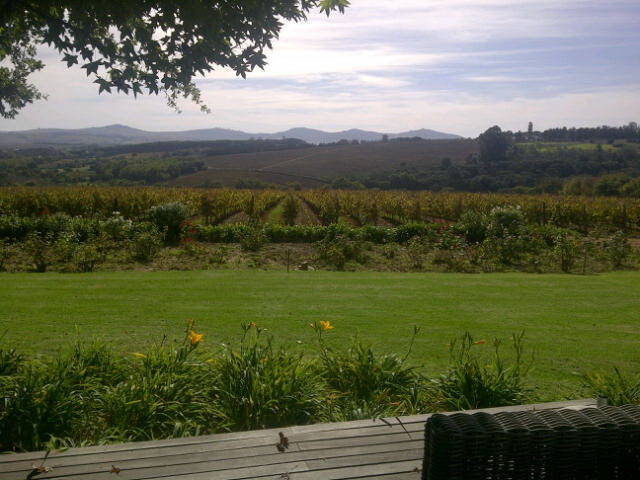 Pleasantly surprised with the wine, views and service!! 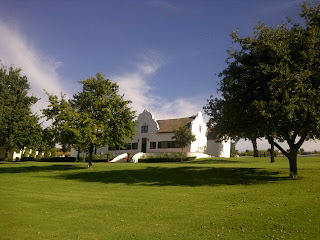 I highly recommend visiting this estate. 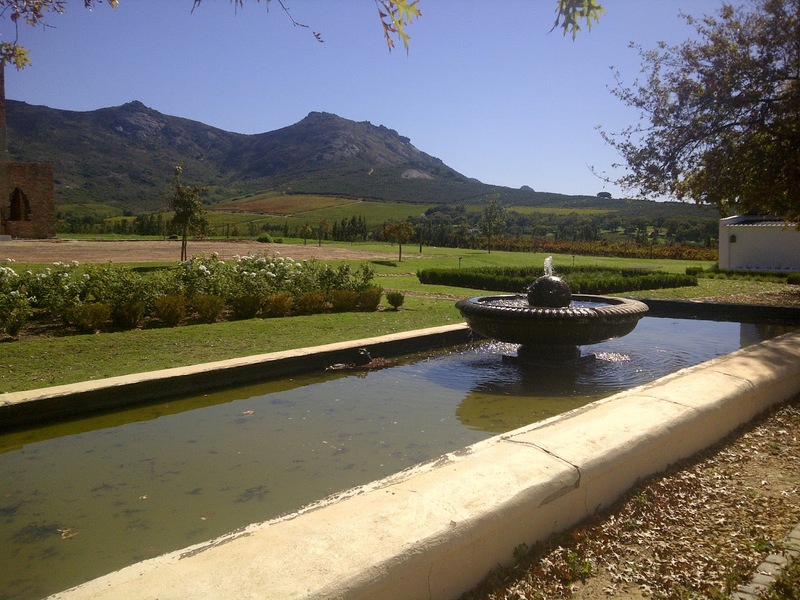 Today I spent all morning at SARS in Paarl so I decided to reward myself with a visit to a wine estate while out that way. After a tweet to my followers asking which wine estate I should visit, Vondeling suggested I visit them, so I did. As soon as I arrived I was so grateful for the suggestion and for making the trip out there. 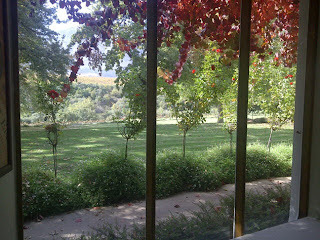 At this time of year all the vines are changing colour, so there are beautiful reds, orange and yellow coloured leaves. 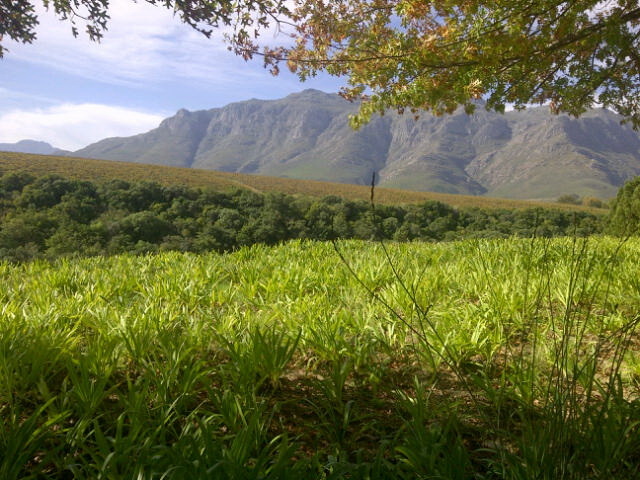 They have such a lovely location near the mountains and surrounded by hills, grass, trees; it's so tranquil and beautiful. 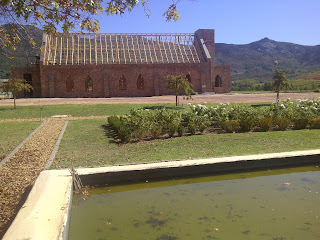 As I got out of my car and was soaking up the views, I noticed a church being built on the estate. 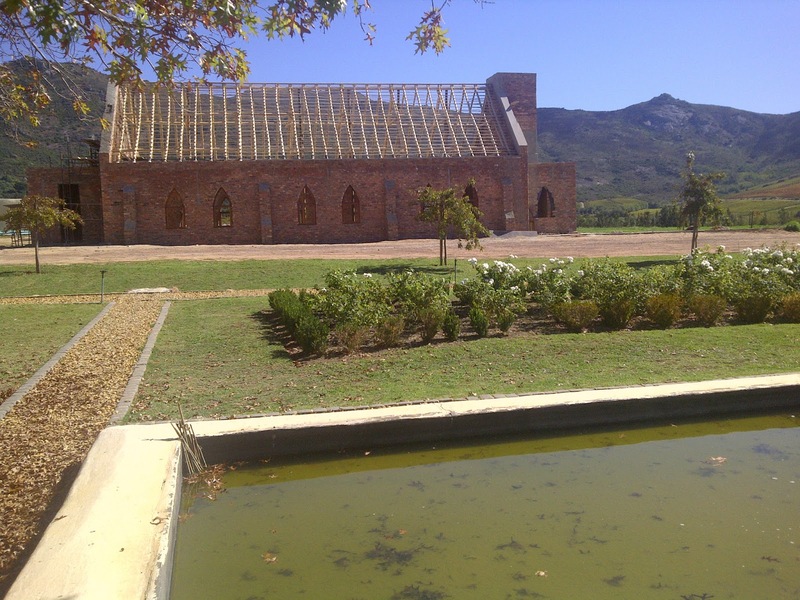 Once this church is complete, brides-to-be can enjoy their wedding ceremony and reception at this wine estate. 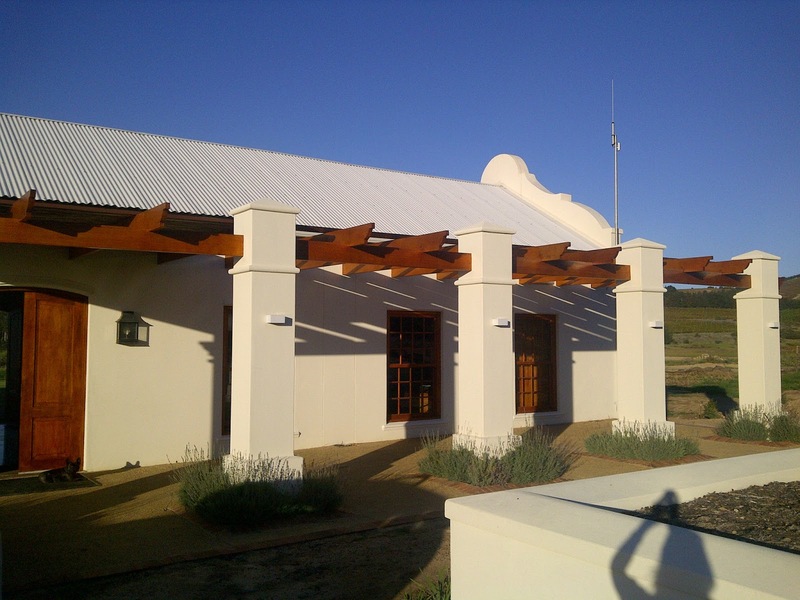 With the church, views, lovely tasting room for a venue and the stunning outdoor area this is an ideal place to have a wedding!!! After the initial surprise on how lovely the views were, I moved into the tasting room. 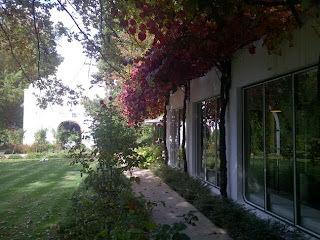 On arriving at the tasting room Mariaan greeted me and welcomed me to the estate. 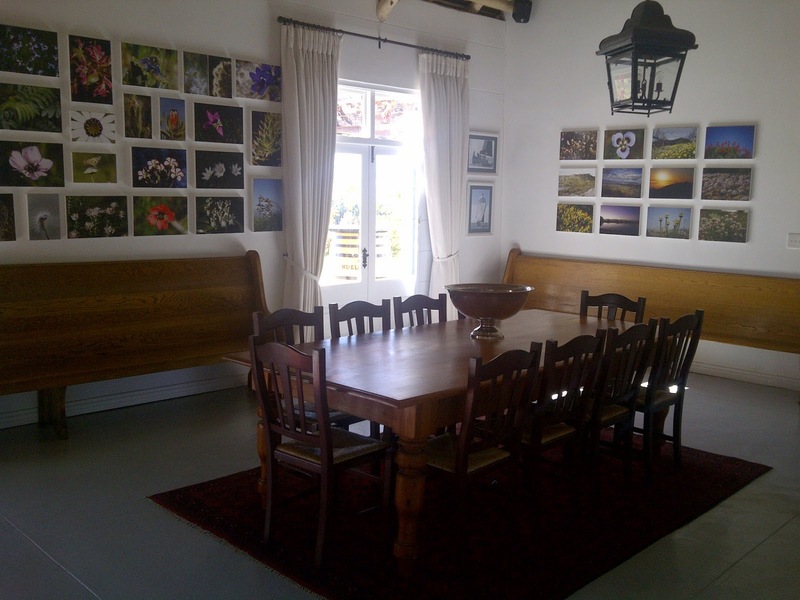 She told me about the history of the place, how long she has worked on the farm, the name of the region, the fynbos on the nearby mountain, and showed me the lovely views from the tasting room patio. Vondeling Petit Blanc R42.50 a bottle is a blend of 70% Chenin Blanc, 20% Viognier and 10% unwooded Chardonnay. This wine had beautiful sweet tones on the nose and on the palate. I could smell the viognier on the nose; that I associate with the smell of peaches. On the nose I also smelt sweet melon (orange/peach flesh melon). 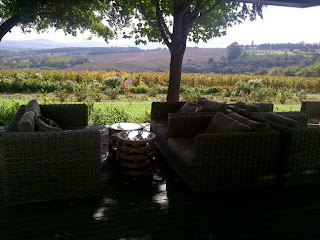 The wine was smooth, soft, approachable. Tones of pear, apple and melon. Refreshing finish with hints of green melon, lime, lemon zest. Very nice. I liked this wine. It is very good value for money. 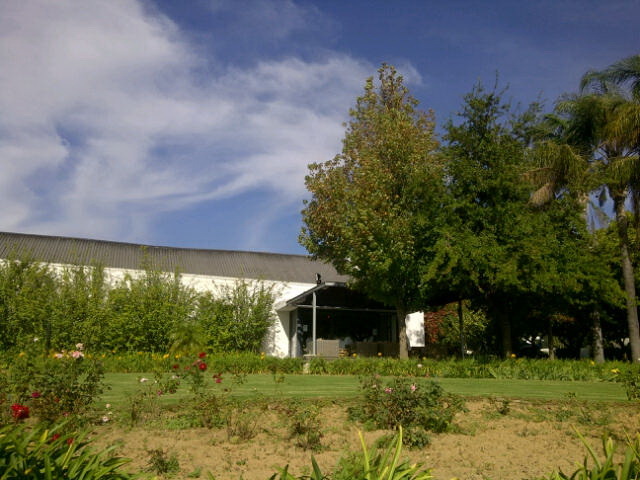 Vondeling Sauvignon Blanc R55 a bottle. This wine was soft, not too acidic, floral, fruity, and had slight vanilla tones on the nose. It was rounded and creamy. Lovely on the nose, the nose opens up with time, and the fruity flavours are rather prominant. Tones of apple, pineapple and banana on the palate. It had a granny smith apple lingering finish. I liked this wine. 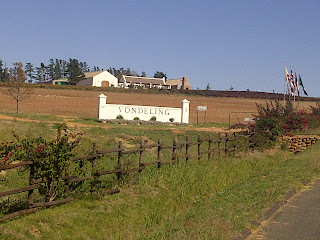 Vondeling Chardonnay R82 a bottle. Smells like a Chardonnay but not too wooded. Only used 2nd and 3rd fill barrels and the barrels are 500 litres. It was creamy, soft and elegant. Gorgeous on the nose; that of butterscotch, honey, citrus, and intense aromas. 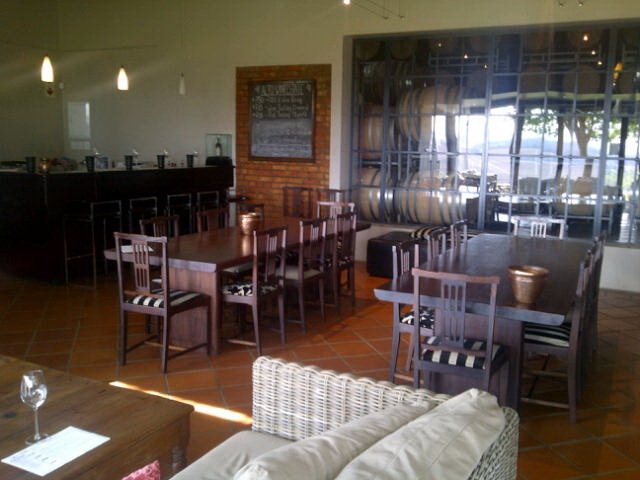 Vondeling Babiana R105 a bottle. 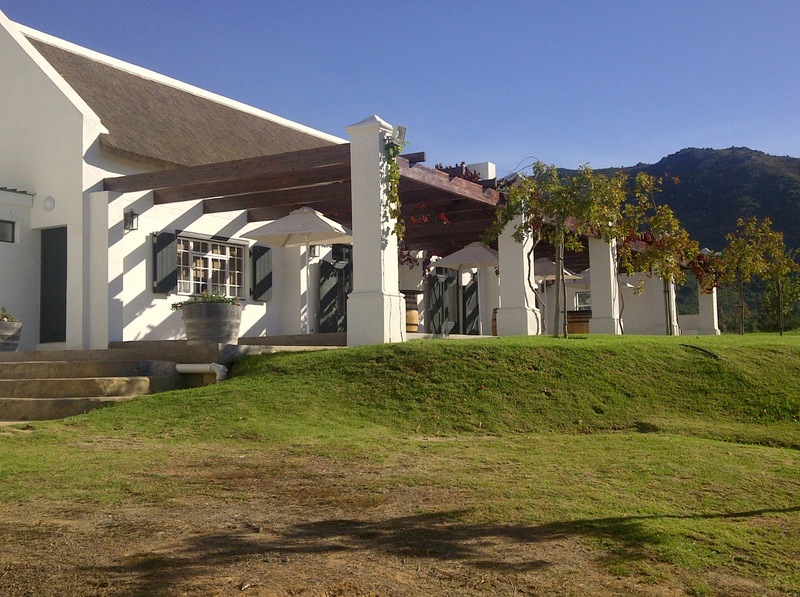 Named after the Babiana Noctiflora flower from the mountain near the wine estate. There was lavender and honey on the nose. A bit of jasmine, ginger, and coconut also. On the palate I could taste tones of honey and pear. It had medium body with lovely texture. 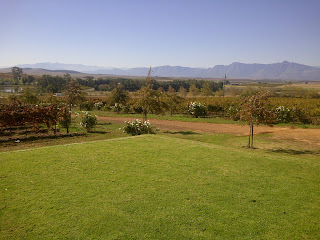 The wine varietals all spent 7 months in 2nd and 3rd fill barrels and after blending spent another 4 months in barrels. Mariaan informed me that this wine is very nice if you decanter it and it is best not to serve it too cold. 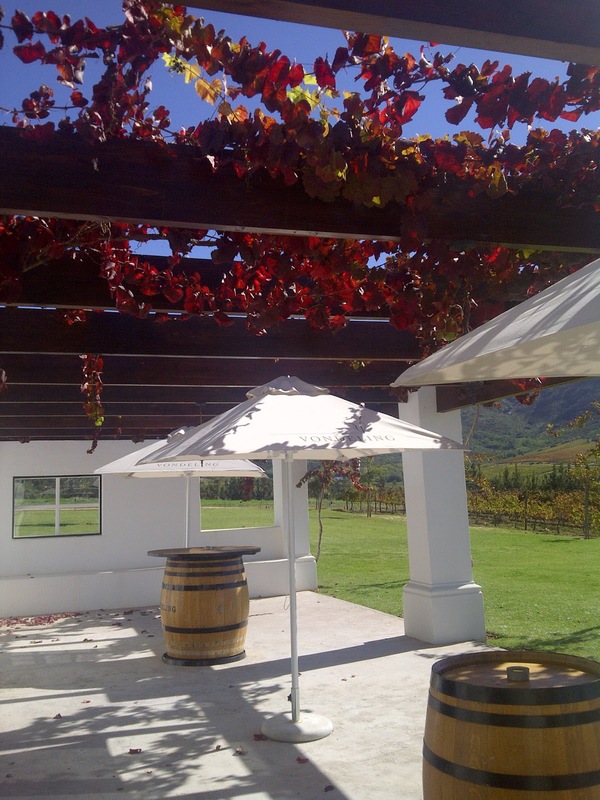 Vondeling Petit Rouge R45 a bottle. This wine is a blend of 60% Merlot and 40% Cabernet Sauvignon. It was very fruity, had lots of dark berry flavours with hints of dark chocolate and dark cherries. Cherry on the nose. This wine was a little dry. 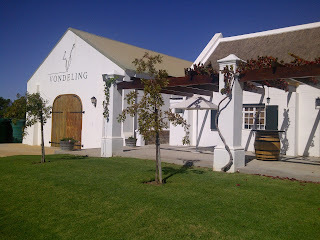 Vondeling Baldrick Shiraz R60 a bottle. 86% Shiraz, 10% Mouvedre and 4% Viognier. It was light, slightly spicy. Dark berry, exotic spices, bit of white pepper, fruity flavoured. Smooth, round mouth feel, delicious!! Lovely finish. Not dry. Like!! 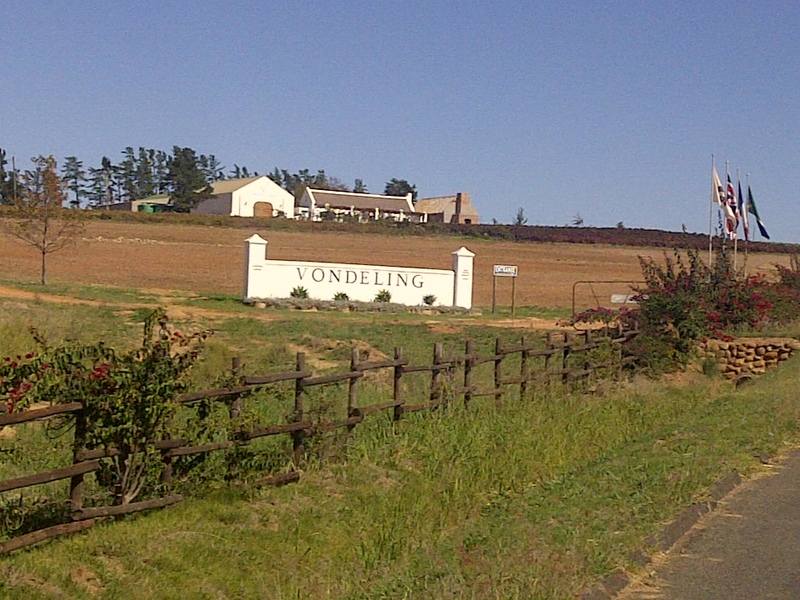 Vondeling Cabernet Sauvignon/Merlot 2007 R90 a bottle. This wine is 60% Cabernet Sauvignon and 40% Merlot. It was soft, smooth, had a fruity/berry nose. It was a soft smell on the nose with hints of toffee. Beautiuflly balanced. Ready to drink now. Slightly brickish in colour. Cherry, fruity, juicy on palate. Like. 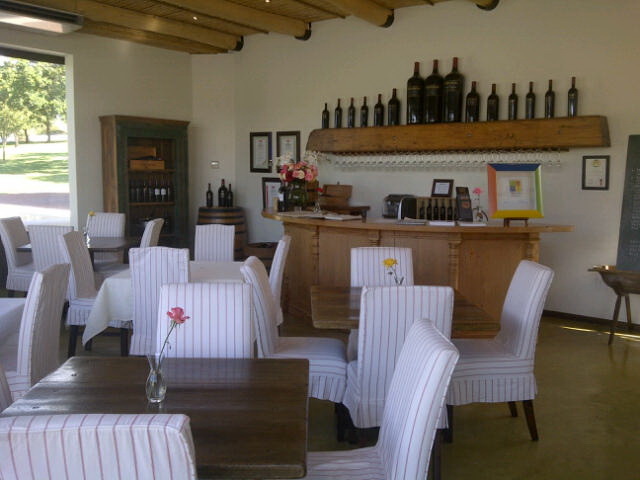 Vondeling Erica Shiraz R120 a bottle. Mostly Shiraz but also has small portions of Carignan, Grenache Rouge and Mouvedre. This wine was named after the flower Erica Hippurus. It had an intense spicy nose. Smells heavy and serious. A bit of coffee, chocolate and caramel on the nose. Ideally you want to decanter this wine. It is a little dry. On the palate it is full of fruity, spicy flavours. Delicious!! Med-full bodied wine. I like this wine. Last but not least we tried the Vondeling Sweet Carolyn at R145 a bottle. With this wine you get citrus, peach, honey, apricot, and tangy acidity. I also got some marmalade on the palate. This wine was not syrupy at all. I was informed that this wine goes well with cheese, pate and is best served ice cold. It is light on the palate. It is a natural sweet wine, thanks to the methods the winemaker Matthew Copeland used. 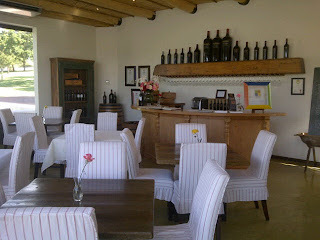 Be sure to ask the winemaking process of this wine, it is very interesting!! It includes crimping, grapes looking like raisins, the grapes were put on beds of straw, left for ten days and then basket pressed. Alcohol level is only 9.5%. I loved this dessert wine!! 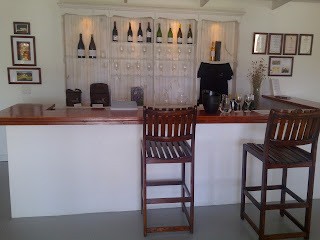 As you can see they have a nice range of wine to try. 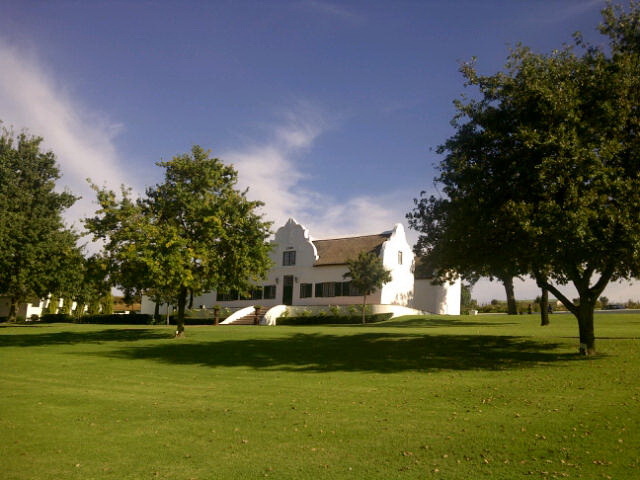 If you decide to visit this estate with a group of 6 or more people, be sure to contact them in advance and ask for a picnic to be put together for your group. Alternatively, if the weather is not so great and you give them two days notice, they can put some lovely winter dishes together for you and your friends to enjoy. They do traditional SA food for both the picnic and winter dishes. 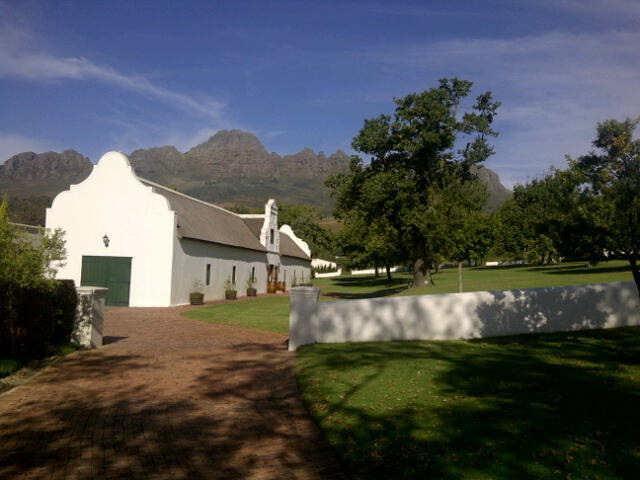 They do cater for weddings here also. 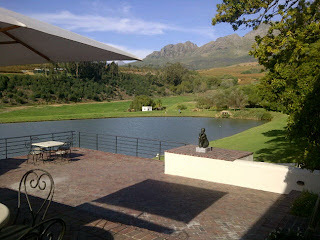 I have to say it's a stunning venue. They bring in caterers to do the food. They can accommodate around 80 people with a dance floor and 100 people without a dance floor. 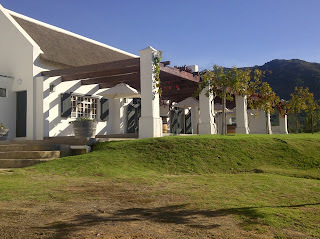 I highly recommend visiting this wine estate, it really is a lovely place with lovely wine and service! !